Since Vietnam, dogs living and working alongside our military have saved over ten thousand lives. Starting this instant, can they save tens of thousands more with help from New Media? One example is the story of US Army Sergeant Logan Black and his best friend and fellow soldier, Diego, a peppy and outgoing bomb-sniffing Labrador. Logan was on mission in Iraq when Diego suddenly stopped him in his tracks indicating he found explosives. Those explosives turned out to be buried too deep even for Army metal detectors and could have killed Logan and several nearby soldiers. Logan left the Army in 2007 and would soon launch a Facebook and Twitter campaign to find and reunite with Diego. It worked, and Logan was ultimately able to adopt him! “Somebody on Facebook saw my page and said, ‘I think I know this dog. I think he is down here at Lackland Air Force Base,’ and that’s kind of how it all started through social media,” Logan told a local news station. Today Logan and Diego live happily together as best friends, and help each other overcome their PTSD. Recently, they even both accepted awards – Logan received the Philip Pisitilli Silver Veteran’s Medal while Diego received the Special Service Award. 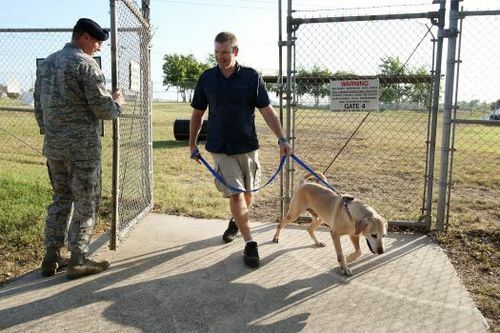 Right now, New Media is running 24/7 to bring adopted dogs home from Iraq and Afghanistan. Rufus, Target and Sasha were three such dogs in Afghanistan that foiled a suicide bomber’s attempt all by themselves, saving as many as 50 US soldiers! Sadly, Sasha perished in the blast, but Rufus and Target survived, were recognized as heroes and became the focus of a hugely successful Facebook and crowdfunding campaign that brought them to the US and into the homes and families of two of the soldiers they saved. That same Facebook campaign also launched the beginning of what would become the “Puppy Rescue Mission,” which has continued onward and brought home an additional 400 “battle buddies” and raised over $1.5 million and counting! Let’s help them rescue another 400 dogs and raise another $1.5 million! New media is helping military dogs get home, but what is it doing for veterans when they get back? Organizations like SAVE-A-VET use Facebook and crowdfunding to bring disabled military dogs to veterans struggling with PTSD, so the dogs and the veterans can recover together. SAVE-A-VET next plans to use New Media to help even more veterans by mounting support to open facilities where retired and disabled vets can live with retired and disabled military dogs, and work to get each other better. They can also use your help by gathering vehicle donations, personal property donations, donated treats, collars and leashes and even partake in their co-branded Visa credit card program. These are some of the projects, we are just touching on a few – there are many, many more! As you can see, I feel very strongly that dog loving people, hero admirers and a global community of friends have made a difference and can keep making a difference and feel great doing it. We have the great privilege and opportunity to directly help thousands of military dogs (and their families), using New Media immediately. Isn’t that great? Let’s do it!